I’m not really sure what clicked in me that made riding a bicycle as a primary form of transportation so normal. I mean, from the outside it looks pretty scary, what with all the cars and pedestrians and chances to fall in sinkholes, and I’m hardly a daredevil, but somehow it was just instantly the best way to travel for me, and it’s totally the logical choice. When I moved to Baltimore the plan was to keep biking to work every day, like I had in New Orleans. That, though, was a quick two mile ride on flat terrain–10 miles each way to Baltimore County, hills included, riding with the big cars on Wilkens Avenue…well, that wasn’t so easy to stomach. I drove the first two years, and then when my car died, I multimodally commuted–Brompty to the MARC train, now my bike to the shuttle. What made just biking all the way seem impossible? Ben rides all the way there and back from my neighborhood. Maybe it could be normal for me to do so as well, and wouldn’t that be an easy way to up my weekly mileage? So I took Ben up on his offer to ride with me out to campus to remind me that yes, I can certainly ride to work. So I got up early, met him before 7am, and followed him down the hill, over, and up to campus. And it was totally doable, and hills that I remember as daunting weren’t, and I got to ride along the Gwynns Falls Train and through its tree tunnels, and it wasn’t even too hot in the morning. We wound our way through Arbutus and went our separate ways, a thank you for the morning ride, and I never had to sit in traffic. Turns out knowing you can do something and doing something are two different things. Thanks, Ben, for the reminder. And then it was all meetings and meetings, and N. said she’d be on the shuttle, so I was too, my bike on the front, and then riding up the hill to home. I loved riding to work, and I loved having the option to cut five miles off the ride home. I made a stop before I got there, though, at Local Color Flowers, to pick up Week 1 of their flower CSA. I’ve been waiting for this to start–a fresh bouquet of locally-grown flowers every other week for months and months. An exceptional treat that marks, for me, the official of summer. I mean, look at those peonies and gerber daisies! Maple and sunflowers and dill! Summertime, summertime, thank you for your promised return. 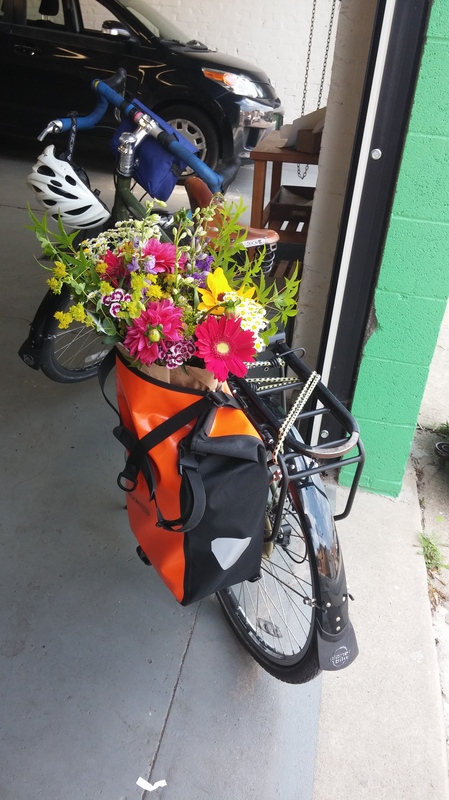 This entry was posted in commuting and tagged Arbutus, commuting, Local Color Flowers. Bookmark the permalink. Is that a Sunlite Fortress Pannier? I have the one that sits on top of the rack, but in white. I can squeeze my rain jacket and lunch bowls into it, or my locks for when I go to the store. I have Grocery Getter panniers for the sides.